If you are looking for South Beach luxury in North Beach Miami, look no further than Akoya Miami Beach luxury condominiums. Nestled in the heart of the budding NoBe neighborhood, Akoya has been a staple since its building in 2004. Located on 6365 Collins Ave., Akoya Miami Beach is just steps from the beautiful white sand beaches of South Florida and the vibrant community of North Miami. This beautiful 48-story glass structure has 386 total units with studios, one, two, and three bedroom models currently available for sale. 245 square foot studios start at just $219k and spacious 1,761 square foot three bedroom models sell for just $2.2M. Perhaps the best feature of Akoya Miami Beach is the tranquility of the neighboring Atlantic Ocean, Intercostal Waterway, and Allison Park. The luxury residences at Akoya Miami Beach were built to the highest standard of high-end real estate. Kitchens feature stainless steel appliances, microwave and hood combination, polished chrome fixtures, built in refrigerator and dishwasher, and a class cooktop for easy cleaning. Italian maple cabinetry line the interior, complete with abundant shelving and a built in pantry. Black granite countertops and backsplashes match the design scheme of your luxury residence. In addition to the beautiful kitchens and living areas, all bathrooms at Akoya Miami Beach luxury condominiums come equipped with marble floors, an American Standard bidet, spa tubs, and beautiful glass shower doors. In addition to the beautiful features inside your home at Akoya Miami Beach, you’ll be in the perfect place for enjoying the outdoors and sports. Akoya boasts a full state-of-the-art fitness center, tennis court, racquetball court, and outdoor swimming pool. If you are a fan of the links, then Akoya offers its very own putting green, so you can get in some practice any time you’d like. All of these features are available exclusively to Akoya residences. When the competition is over, relax in a private beach cabana or on the pool deck. 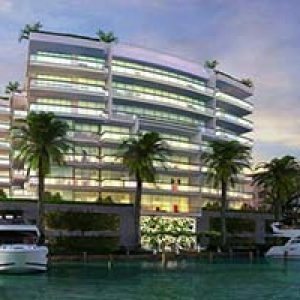 Akoya Miami Beach has everything you need to life the lifestyle you dream of. If you decide to venture off of the premises, you’ll be surrounded by the best Miami Beach has to offer. Just steps from beautiful Allison Park, La Gorce Island, and Normandy Shores Golf Club, Akoya Miami beach puts you right in the middle of the action. You’ll also be close to the world-class dining, entertainment, nightlife, and cultural options in the growing North Beach neighborhood. With easy access to I-95 and US-1, Akoya gives you easy access to both South Florida airports and other vibrant South Florida beach communities. Don’t miss out this unique luxury living experience in the third tallest building in Miami Beach, Akoya Miami Beach.